The AlcoSense Precision beathalyser uses a large electrochemical fuel cell to measure the concentration of alcohol from exhaled human breath precisely and accurately. The AlcoSense Precision has both direct and passive modes. In passive mode no mouthpiece is needed: the subject can simply speak or breathe into the mouthpiece slot. In direct mode you can attach a mouthpiece and attain a highly accurate 3 decimal readout. It is the perfect tool for law enforcement, OH&S, schools, alcohol treatment, emergency room and medical professions. 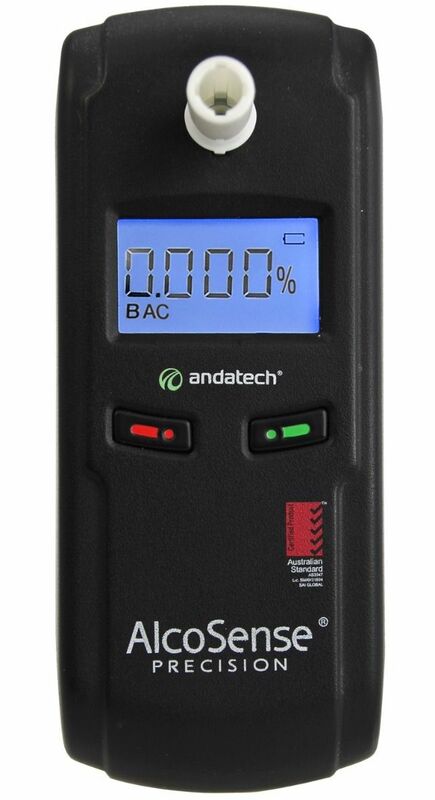 Provides exceptionally fast and accurate readings ranging from 0.000 to 0.400% BAC and reacts only to alcohol. Promises exceptional accuracy and long lifespan to cater to high volume testing. Also able to provide passive mode testing for faster indications of the presence of alcohol. Uncomplicated alcohol breath testing, designed to be easy to use straight out of the box. Great for small to medium workplaces and for clinical use.